Keith has been training assorted martial arts since 1998 and has held various levels of teaching and coaching roles since 2000. He has trained formally in karate (and holds a 3rd Dan black belt), along with archery and sport fencing. His practice of historical fencing began in 2007 at the University of Glasgow, and over the last several years he has helped to develop the Academy of Historical Arts across Scotland. The longsword of Johannes Liechtenauer is his primary weapon discipline, closely followed by the Scottish regimental broadsword. He also quite enjoys sabre, sword and buckler, and simulating the “halfsword” fighting style of armoured combat. A particular interest of Keith’s is the issue of teaching effectively, and he strives to help instructors develop their teaching skills. For contributions to the historical fencing community, Keith received membership of HEMAC in 2011. 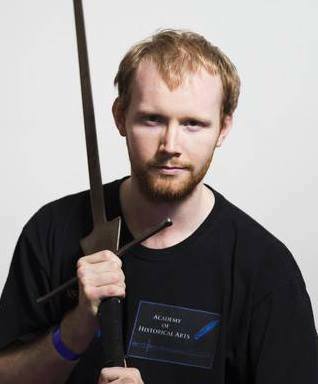 He has authored “Scottish Broadsword and British Singlestick” and the “AHA German Longsword Study Guide”, and is one of the regular contributors to the Encased in Steel online blog.